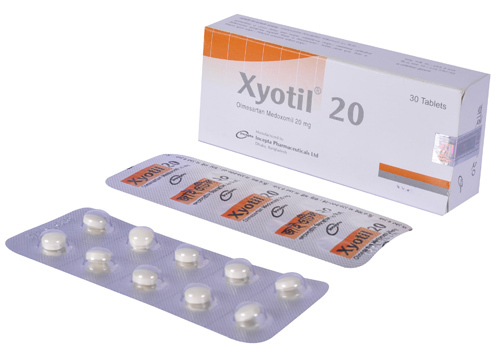 Xyotil 20: Each tablet contains Olmesartan Medoxomil INN 20 mg.
Angiotensin II (formed from angiotensin I in a reaction catalyzed by angiotensin converting enzyme-ACE), is a potent vasoconstrictor, the primary vasoactive hormone of the renin-angiotensin system and an important component in the pathophysiology of hypertension. It also stimulates aldosterone secretion by the adrenal cortex. Olmesartan blocks the vasoconstrictor and aldosterone-secreting effects of angiotensin II by selectively blocking the binding of angiotensin II to the AT1 receptor found in many tissues (e.g. vascular smooth muscle, adrenal gland). In-vitro-binding studies indicate that Olmesartan is a reversible & competitive inhibitor of AT1 receptor. Olmesartan does not inhibit ACE (kinase II, the enzyme that converts angiotensin I to angiotensin II and degrades bradykinin). The usual starting dose of Olmesartan is 20 mg once daily. Dosing should be individualized. Depending on the blood pressure response, the dose may be increased after 2 weeks to 40 mg. Olmesartan may be administered with or without food. No initial dosage adjustment is recommended for elderly patients, for patients with moderate to marked renal impairment (creatinine clearance < 40 mL/min) or with moderate to marked hepatic dysfunction. If blood pressure is not controlled by Olmesartan alone, a diuretic may be added. Olmesartan may be administered with other antihypertensive agents. The usual recommended starting dose of Olmesartan is 10 mg once daily for patients who weigh 20 to <35 kg, or 20 mg once daily for patients who weigh > 35 kg. For patients requiring further reduction in blood pressure after 2 weeks of therapy, the dose may be increased to a maximum of 20 mg once daily for patients who weigh <35 kg or 40 mg once daily for patients who weigh > 35 kg. Treatment with Olmesartan is well tolerated. 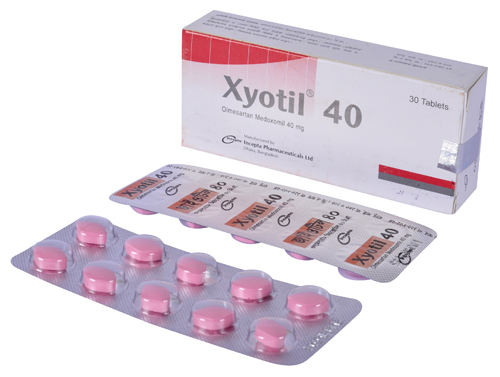 The common side-effects are dizziness, diarrhoea, headache, back pain etc. Other adverse effects are chest pain, peripheral edema, abdominal pain, dyspepsia, gastroenteritis, vertigo etc. - Periodic determination of serum electrolytes should be performed at appropriate intervals to detect possible electrolyte imbalance. - When pregnancy is detected, Olmesartan must be discontinued as soon as possible. - Hypotension in volume or salt-depleted patients may occur. Safety and effectiveness in both pregnant women & nursing mother have not been established. So, Olmesartan should be discontinued during both of these conditions.